Hi! 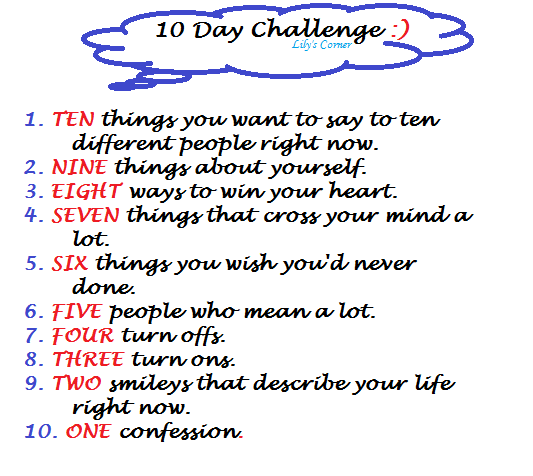 How long had it been since I posted about the Ten-Day Blog Challenge I decided to participate in? You don't remember? Well, I totally understand! It's been ages! I was only able to complete #1 of the list which is "10 Things I Want to Say." #9: I am a twenty-something Filipina Nurse who works for the Department of Health. I guess most of you already know that! #8: I have two dogs, namely Sam and Chloe. They make my life happier. Really. #4: I hate it when I know the truth and people still lie. I hate it more when they try to deceive me and/or feed me with half-baked truths. Yeah, that's why I kinda find it hard to trust people I've only been with for a few weeks. #3: I am generally kind to others. I always try to respect them no matter how bad they've been to me. #2: I say NO to smoking. It's a major turn off! LOLs! But seriously, you guys should stop it. I believe being healthy is the best gift you can give to your loved-ones. #1: I am just as scared as everyone else when it comes to speaking in front of a huge crowd or leading a group in an activity. It just doesn't show!! !